(A) Under the guidance of a natural resources professional, carry out an investigation of an ecological subject approved by your Advisor. Inventory and map the area. Conduct a detailed investigation providing specific data for a specific topic. 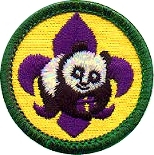 (B) Document and present your findings to your crew, another crew, a Cub Scout or Boy Scout, or another group. Show the relationships of global events and conditions both political and environmental, to the areas that you described in steps 1 and 2 above. Determine how conditions in your local area also appear in other areas around the world. Describe some of the interrelationships between people and our natural resources that affect our global environment. Teach other in your crew, another crew, a Cub Scout or Boy Scout group, or another group about the inter-connectivity that we will all have with each other and our environment. Venturers can earn several of the awards that Boy Scouts can so be sure to check out the National Awards and Recognitions for Boy Scouts page.